You probably noticed that CMS always seems to get a little less luminosity than ATLAS. In the latest fills, I noticed CMS is always a bit earlier (one or two minutes) with taking data so that during the first few minutes or so, their integrated luminosity is higher than ATLAS. Of course, with ATLAS getting more, they are quickly taken over, but at least at the beginning, they are ahead. I wonder what it feels like to be in the control room over there. 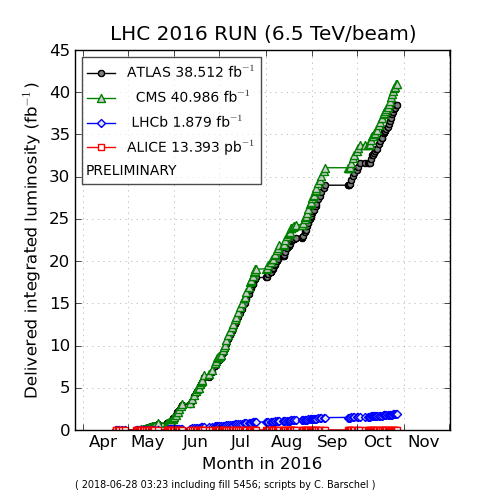 Re: CMS and ATLAS luminosity: are they jealous? The difference between the shown values is a few percent. The experiments are happy if the luminosity uncertainty towards the end of the year is a few percent, the online calibration is worse. The difference is probably just a different calibration, while both experiments really get a very similar luminosity. Tau wrote: You probably noticed that CMS always seems to get a little less luminosity than ATLAS. That is a very interesting presentation. I learned a lot more than the intensity differences. Atlas had some Lumi measurement problems in the last fill. With the wrong lumi data CMS equals to Atlas for integrated. Suprisingly the instant lumi in todays fill is now equal, too. Looks like CMS completetly recalculated the online lumi. Does anyone know why the CMS luminosity is 10% larger than ATLAS, despite being the same before the MDs?